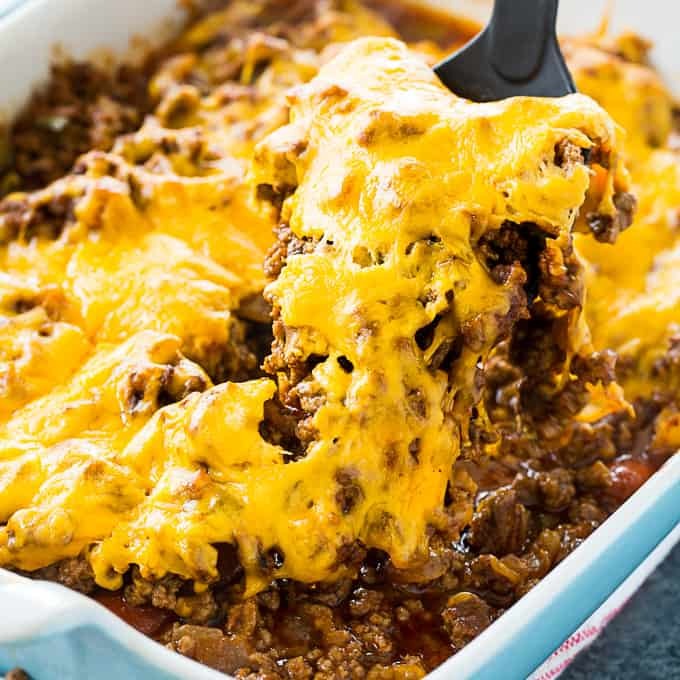 Low Carb Chili Dog Casserole is a delicious mixture of all-beef hot dogs, chili, and cheese. You’ll never miss the bun! This easy family recipe is keto-friendly and gluten-free. It’s pure low carb comfort food and one of my favorite casseroles for summer. Since I’ve started really watching my carb intake, I feel so much better and am down a few pounds too. Starchy carbs like cakes, breads, and cookies are so addicting for me. 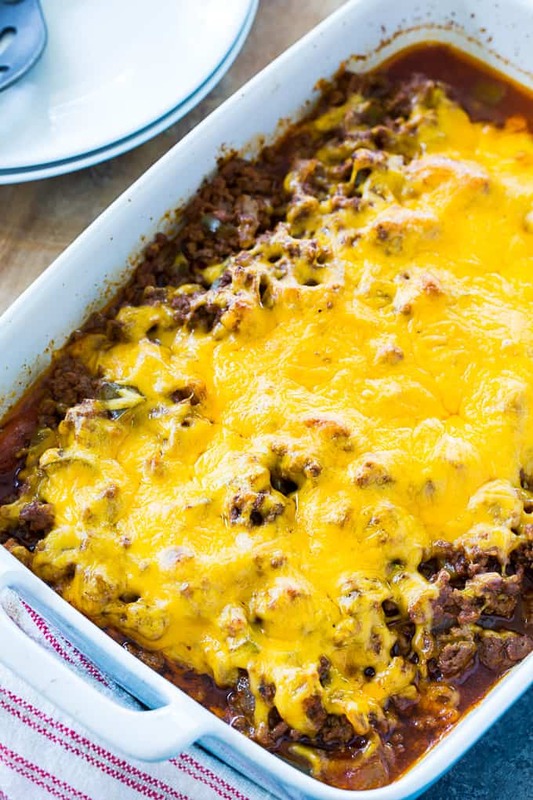 I find that my success on low carb diets relies on me eating plenty of foods that still feel like comfort food and this Low Carb Chili Dog Casserole really fits the bill. Brown the ground beef along with the onion and peppers in a large nonstick pan. Add garlic, cumin, and chili powder and cook 1 more minute. Next, stir in tomato sauce, tomato paste, beef broth, Worcestershire sauce, salt, pepper, and brown sugar erythritol for just a little sweetness. Cut each hot dog lengthwise and place in a greased casserole dish. Cover with the chili mixture and sprinkle with cheddar cheese. Bake until hot and bubbly. So easy even a beginner cook can rock this recipe! Try serving this casserole with sugar-free ketchup or sour cream and chopped onions. It’s such a hearty, filling casserole it paris perfectly with just a simple, green salad for a meal. 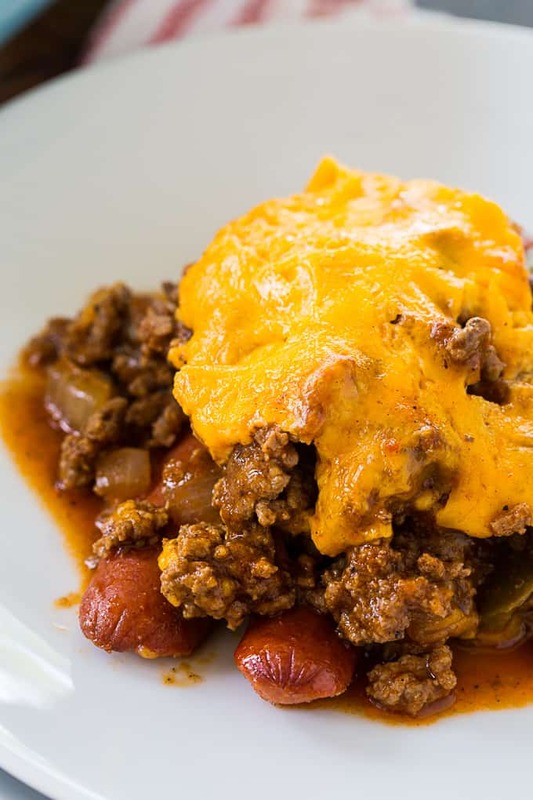 Low Carb Chili Dog Casserole is a delicious mixture of all-beef hot dogs, chili, and cheese. You'll never miss the bun! 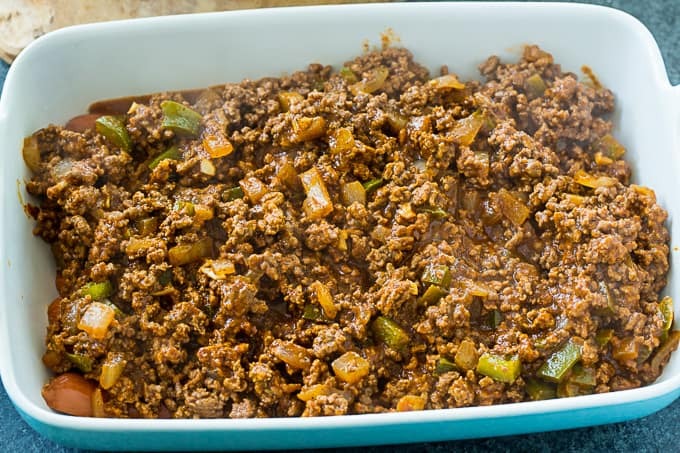 Add ground beef, onion, and green pepper to a large nonstick pan and cook over medium-high heat until beef is cooked thorugh. Crumble it apart as it cooks. Stir in salt, pepper, Worcestershire sauce, brown sugar erythritol, tomato sauce, tomato paste, and beef broth. Simmer for 20 minutes. 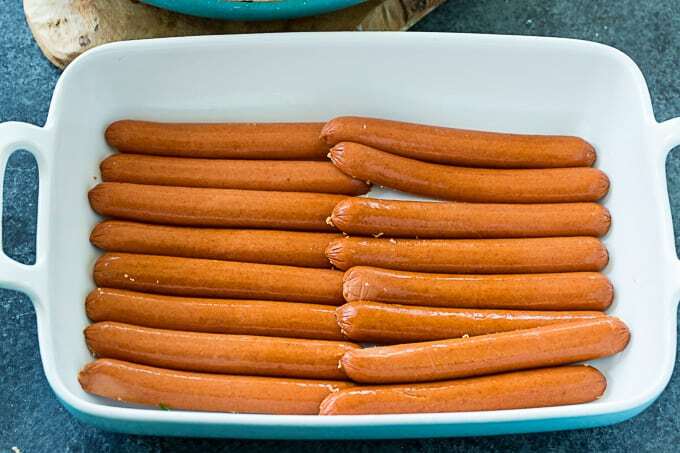 Cut each hot dog in half lengthwise and place in bottom of prepared pan. Pour chili mixture on top. Sprinkle with cheddar cheese. Bake for 15 to 20 minutes or until hot and bubbly. What I love most about your low carb chili dog casserole is that it tastes fantastic with sugar-free ketchup or sour cream with onion rings and is perfect with a light green salad for a filling dinner. My dad would sure love to have variations of this authentic southern cooking recipe done every other month during our dinners at the old folks’ country home. Not only would this treat be healthy for the whole family, but it would also be great since it’s also low in salt, fat, and calories! 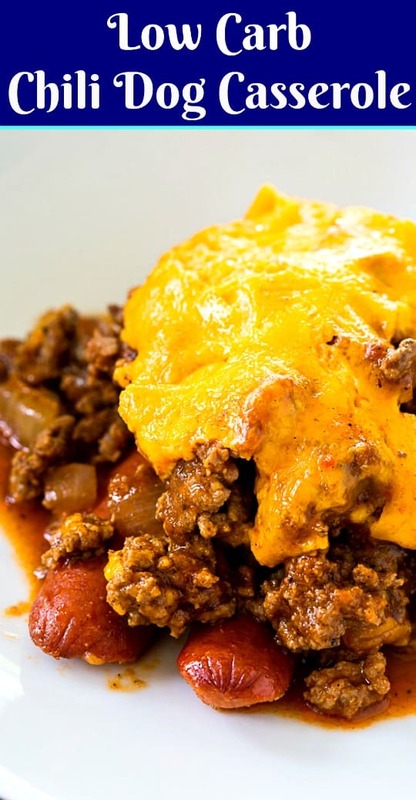 Going to try this recipe for my hubby who’s a diabetic and loves his chili dogs! !